Tropical Storm Hagupit, which was downgraded from a typhoon yesterday, has battered the Philippines for the past few days. The damage is extensive, according to Red Cross officials. Nearly 1,000 homes have been destroyed as a result of the storm, and the body count currently sits at 27 people. Though the storm seems to be losing power, there is a strong concern about flooding in the capital city of Manilla as the storm continues to move through the island nation. Humanitarian trucks are currently working on reaching the more remote areas affected by the storm, where little is known about the extent of damage done. Firefighters responded to a fire around 1:30 a.m. yesterday in downtown Los Angeles. When emergency crews arrived on the scene, they found two apartment buildings, one under construction and another receiving renovations, were almost entirely ablaze. 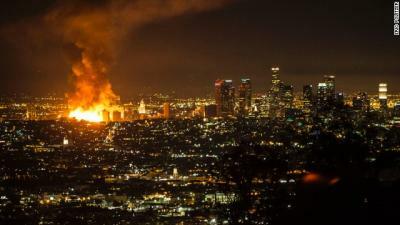 The first building was seven stories tall and contained nearly 1.3 million square feet, according to LA Fire Department Chief Ralph Terrazas. It took over 250 firefighters to get the blaze under control, but luckily no injuries were reported. A small subdivision in Gaithersburg was rocked by tragedy yesterday after a twin engine plane crash into a house, killing six. Of those killed, three were Marie Gemmel and two of her young children, Cole, age 3, and Devon, only an infant. Their bodies were recovered in their home, where the plane had landed. Also among the deceased was Michael Rosenberg, CEO of Health Decisions. Though no statement has been made regarding the cause of the crash, NTSB officials have indicated that they recovered the plane's "black box" event recorder and are analyzing the data contained in it. Just before noon yesterday, two men entered the Downtown Grocery, located on Washington St. in Meadville, and robbed it. The suspects, described as two white males, entered the store together. One suspect held the store's employee while the other emptied the cash register, according to a police officer. Meadville Police are continuing to investigate the matter. Erie Police are still on the hunt for their eleventh murder suspect after a fatal shooting last Saturday. Police responded to a report of shots fired at W 18th and Raspberry just before 1 a.m. When they arrived at the scene, they found 24 year old Jaree Warren lying in the street. He was taken to UPMC, where he later died from his wounds. Police are currently interviewing witnesses and reviewing security footage from nearby businesses in order to find their suspect.